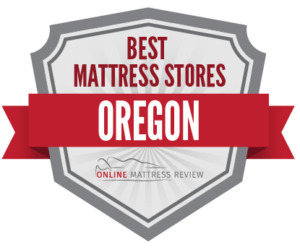 Searching for the best mattress stores in Oregon? We’ve put together a list of the best in the state to help you find what you’re looking for. If you are looking to find a mattress in Oregon, there are boundless options. However, as a savvy shopper, you know that more mattress shops in Oregon doesn’t necessarily mean better. In many instances, choice fatigue just makes shopping more confusing, more stressful, and ends up wasting your valuable time. To help with that, we searched through the highest-ranked mattress stores in Oregon and found companies that carry high-quality products, employed trustworthy customer service practices, and made shipping a breeze. We looked for other bonuses like money back guarantees or warranties, locally run operations, and affordability. We then organized our findings by region and compiled them all in one spot. One positive thing about the industry’s growth is accessibility. Not only can you find a quality mattress in places like Portland, Eugene, and Salem, but today, thanks to the expansion of the market, you’ll readily find mattresses in smaller cities and towns across Oregon like Bend, Ontario, Adiran, Vale, Huntington, Jordan Valley, Shady Cove, Bonanza, Merrill, Chiloquin, Monument, Mitchelle, Seneca, Burns,and Sweet Home. Are you wondering: where can I find the best mattresses in Portland? We are here to help. The idea of purchasing a mattress doesn’t have to keep you up at night. We know what you’re looking for- a high quality mattress that is priced within your budget, and delivered in a timely and reasonable fashion. That’s not a lot to ask, but so many mattress stores get it wrong. Here are the ones that don’t. If you’re looking for a great mattress in Portland, the first place you may want to check out is Mulligan Mattress Company (1200 SE 7th Ave.) Mulligan Mattresses are chemical-free and handmade. Each mattress is designed to fit your body type and if you are unsatisfied with your mattress, Mulligan will replace or refund! This is one of the biggest issues with mattress shops across the state, but not an issue at Mulligan. Not only are the mattresses chemical free and high quality. They are affordable and the owner and maker’s customer service skills are unmatched. If you need a mattress to fill an unusual space, Mulligan Mattress Company can do that for you as well. Mattress Lot (2406 NE Sandy Blvd.) is “Portland’s only gold certified sustainable mattress store.” Not only that, but this store is the opposite of everything you loathe about your typical mattress purchasing experience- high pressured sales, commissioned sales people and gimmicks are not present here. There’s even a TEDx talk about this mattress shop. You guessed it, all of the mattresses are chemical free, made locally, and sold with consideration of your time and your budget. They also offer a wide-range of mattresses from soft to extra firm and the sales team is exceptionally knowledgeable and patient. If you aren’t satisfied with Mulligan Mattress Company or Mattress Lot, you could head into Parklane Mattresses (536 NW 14th Ave.). Here you’ll find some high quality mattresses, made with your body in mind. The price is below competitive, and the customer service team are the right blend of hands-off and hands-on. If you need your previous mattress recycled, this is no problem either. Portlanders rejoice- you have some quality mattress shops right on your doorstep. If you are looking for the best mattress stores in Eugene, you are in the right spot. Eco Sleep Solutions (25 E Ave) offers a number of great options for anyone who is looking to sleep on top of a toxin-free and organic mattress. They also carry high quality organic beds, and bedding. This locally-run mattress shop sells premium mattresses at competitive prices. You even have 90 days to test your mattress and can swap out and make adjustments as needed! In addition, the owners and sales staff are incredibly patient and knowledgeable. To top it off, delivery is a breeze. If you are inquisitive, looking for a mattress to help save your from restless nights and back pain, then head here for answers and relief. Mattress Mania (2177 W 11th Ave.) offers a wide selection of mattresses for a variety of price points. They even offer discounts for students. The sales team are knowledgeable and friendly, and provide a no-pressure atmosphere. If you need to find a mattress near Eugene, you could head into Springfield. The Mattress Company (3270 Gateway St. Ste A) is a great mattress shop located in Springfield, Oregon. This locally-run business offers quality mattresses, and a no-fuss process from start to finish. The staff are incredibly knowledgeable and will listen and advise where needed. The delivery team are timely and efficient. Here’s a tip: check their website regularly and you’ll likely find a steep discount. Robb’s Pillow Furniture, Futons Beds and Bunks (1851 River Rd.) is the place to head if you need a mattress for your futon. They also sell high-quality mattresses for platform beds. The customer service really shines. In fact, they are known for placing your needs above their own and will go the extra mile for individuals with disabilities and special requests. If you have pains from your mattress or any troubles with sleep, head to Robb’s. If you are looking for a quality mattress store in Bend, Oregon, you now have a few options. Cascade Mattress & Bedroom Furniture (61334 S. Hwy 97) is one of the top-ranked mattress shops in the area. They are known for their quality service, wide selection of top-notch mattresses, great prices, and timely and convenient delivery! Not only that, but you can also find quality pillows, beds, and bedding. Head to BedMart Mattress Superstores (2220 NE Highway 20) for a premium mattress. The company offers the full range of bed sizes and adjustable models. In addition to quality mattresses, the sales team are respectful and patient. If you need to spend time trying and asking questions, this is where to head- no-pressure sales at its finest. The delivery team work hard to make sure you have your mattress on time and are respectful of your home and purchase. If you need a custom build mattress for a unique space, you could try The Mattress Factory (63040 N. Highway 97) where mattresses are custom-built to meet your specifications- and will even build a mattress for your boat if needed. The owner has been building mattresses for over 4 decades. If you are looking for expert advice, head here. If you’re wondering where to find a mattress near Salem, you can rest easy. Mattress by Appointment Salem Oregon (1125 Edgewater St.) offers high-quality mattresses for a steep discount. There are even financing options available. If you want to check out the shop, call ahead to schedule a time. You’ll likely be greeted by the store owner who will help you find a mattress to fit your sleeping patterns, mattress preferences, and your budget. Here’s a tip: do some research ahead of time so you have your questions ready when it’s time to head in for your appointment. If you are trying to purchase a high quality mattress on a tight budget, head to Furniture Outlet (2787 Lancaster Dr. NE). You won’t receive a warranty for your purchase, but you can find incredible affordable mattresses. The sales team are helpful, and will not pressure you to purchase outside of your price-range. For a premium mattress, head to Parklane Mattresses (2825 Commercial St. SE) where you will not only find quality mattresses but people really care about your sleep! The team are knowledgeable, patient, and serious. There are even some great eco-friendly options.